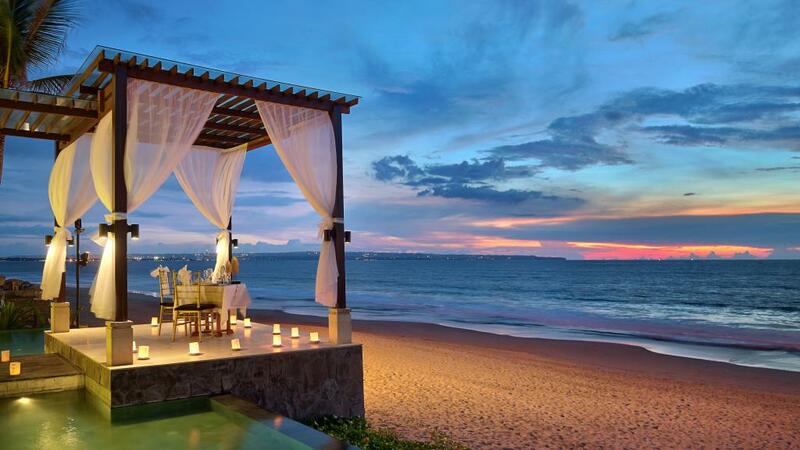 Seminyak, just north of Legian, is Bali's high end spa and boutique shopping capital. Adorned with upmarket, luxury accommodation and fashionable high end restaurants and bars, the atmosphere is more sophisticated and laid back than Kuta. Seminyak beach and Petitenget beach are sweeping expanses of sand that stretch as far as the eye can see. To the south, they become Legian beach and then Kuta beach. Famous for their magnificent sunsets, these beaches are far quieter than those in central Bali. Pura Petitenget rests on the beachside off Jl Petitenget and is a compact Balinese temple known for its stunning beachside ceremonies. It's a lovely temple worth a visit simply for its aesthetic value, however if you're lucky enough to witness one of these ceremonies you'll be glad you made the trip. As the high end spa capital of Bali, your Seminyak spa experience will be one of tranquil relaxation in a luxurious and indulgent setting. While prices in Seminyak are slightly more expensive than other parts of Bali, your spa experience is one of superior quality and prices are still 50% cheaper or more than you would pay in western countries. If you're staying in a hotel or villa, a number of in-house services will be available so you never have to leave the comfort of your villa or hotel. But if you would prefer to get out and about and see the sights then there are plenty of commercial spas offering relaxing massages and treatments. Seminyak is a hub of hip and inventive fashion boutiques, chic designer stores and bohemian art studios. Whether you want to window shop and dream of living the high end lifestyle or you've got the bucks to slash out and really spoil yourself, Jalan Laksmana is a great starting point for any avid shopper. With so much to see and some great discounts on offer, it's easy to lose track of time here. The weather in Seminyak perfectly complements the stylish ambiance of the island with pleasant, balmy temperatures between 20C and 33C (68F and 93F) year round. December to March sees heavy showers and higher humidity due to the west monsoon but the days are still sunny and what showers do occur pass quickly. June to September sees the humidity drop and temperatures cool, particularly in the evenings. At this time of year, there is hardly any rain in the lowland coastal areas. The streets of Seminyak can get quite congested with Jalan Laksmana notorious for being a particularly sticky spot. To avoid frustration, your best options for getting around are to walk or rent a bicycle or motorbike.